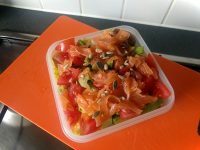 Smoked products are quite trendy at the moment, but I was surprised to be able to find some fresh smoked salmon at the fishmonger. 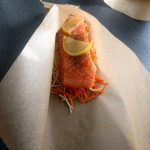 The smoky flavour is pretty soft and quite pleasant, perfect fit for a salmon filet served along with some fresh grated vegetables. 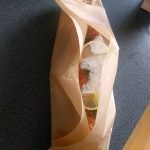 I add the idea of this recipe of steamed smoked fresh salmon cooked in a parcel for a dinner with friends. 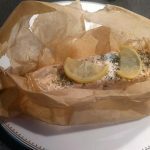 It was already summer and the weather was already quite warm, I wanted to serve some fine food without using too much heat (ie: oven) in order to avoid a suffocating feeling from my guest due to a too high temperature. The steam cooking was a good idea and the fact to use grated courgettes added a summery touch to the dish. The dish was really appreciated by the guests, it required a little bit of preparation for grated both courgettes and carrots but it is not too long. 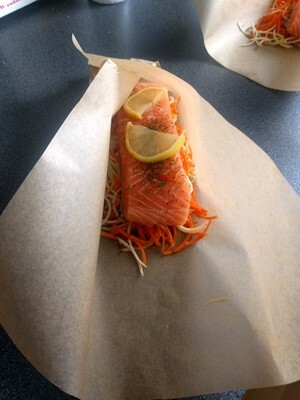 How to make smoked fresh salmon in parcel with grated courgettes and carrots? 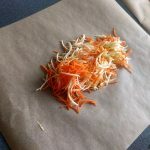 You can mix the two grated vegetables for playing with the colour and the texture of both courgette and carrots. The carrots will tend to stay crispier than the courgette. 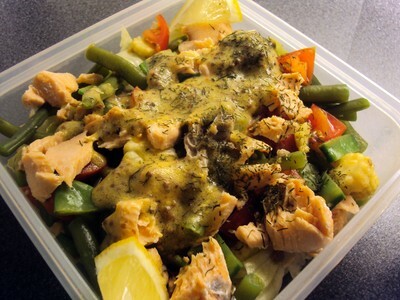 Serve the smoked fresh salmon with grated courgette and carrots straight away. 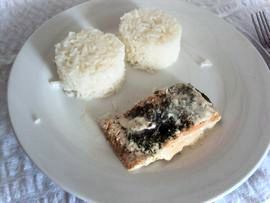 It can also be accompanied by some white or brown rice.